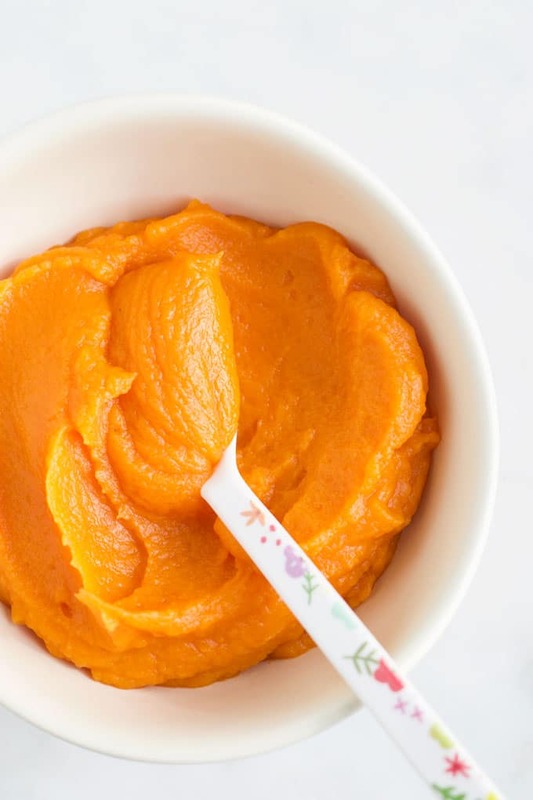 Sweet Potato Puree is a great first food for babies. However, this delicious puree shouldn’t be limited to babies. Store some in your freezer to add extra nutrition, flavour and texture to oatmeal, sauces or baked goods. 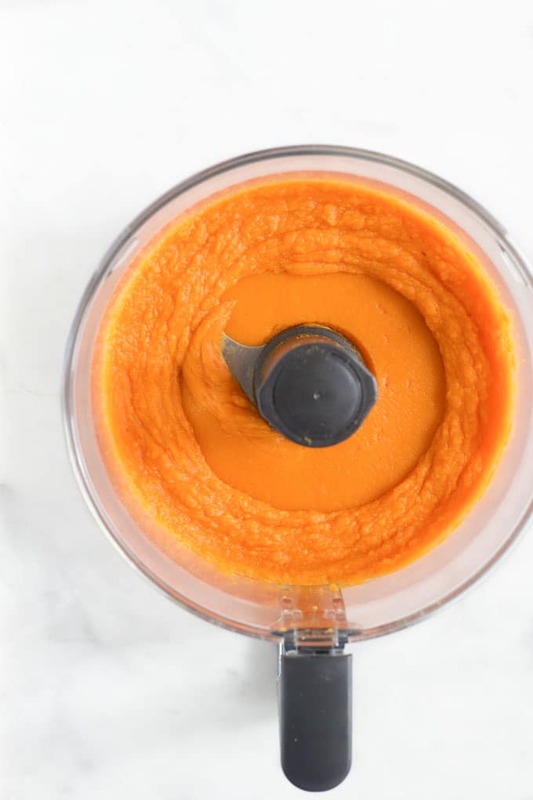 Making homemade sweet potato puree is easy and you only need one ingredient – sweet potato! There are several ways to cook a sweet potato and all methods will work for pureeing but, in my opinion, roasting provides the best-tasting puree. Boiling – Peel sweet potato and cut into 1.5 cm (half-inch) cubes. In a pan, bring water to a boil and add sweet potato chunks. Reduce to a simmer and cook until tender, around 15 minutes. Steaming – Peel and cut sweet potatoes into 1.5 cm (half-inch) cubes and steam, using a steamer, until soft. Food Processor – This is what I always use. Blender – A high-speed blender works great. An excellent source of vitamin A – Essential for growth, healthy skin and for good vision. A good source of Vitamin C – Needed for growth and healing of wounds. It also helps in the absorption on iron. 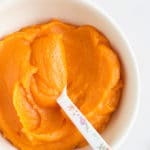 Sweet Potato Puree can be enjoyed as it is or mixed with a range of other pureed or mashed foods. Some suggestions include…. Add to Oatmeal – For a warm and comforting start to the morning! Why not try these Sweet Potato Pie Oats. Use in baking – Great for adding sweetness, using as a binding agent and for adding moisture to baked goods. Use in muffins, brownies and cakes. Add to risotto – Adds a different, yet tasty, touch to a risotto. This sweet potato and mushroom risotto looks amazing! Use it to make pancakes and truffles – for those kids that can’t get enough sweet potato! Stir into Sauces – Add some creaminess and sweetness to a range of different sauces. Mix into smoothies – Sweet Potato goes well with a range of smoothie ingredients and will make a smoothie ultra creamy. Place in an airtight container and refrigerate for up to three days. Flexible ice cube trays work best as it is easier to pop out the frozen cubes. Once they’re fully frozen, quickly pop them all out and place the frozen cubes into a freezer bag or container and return to the freezer. Do not refreeze if puree has previously been frozen. 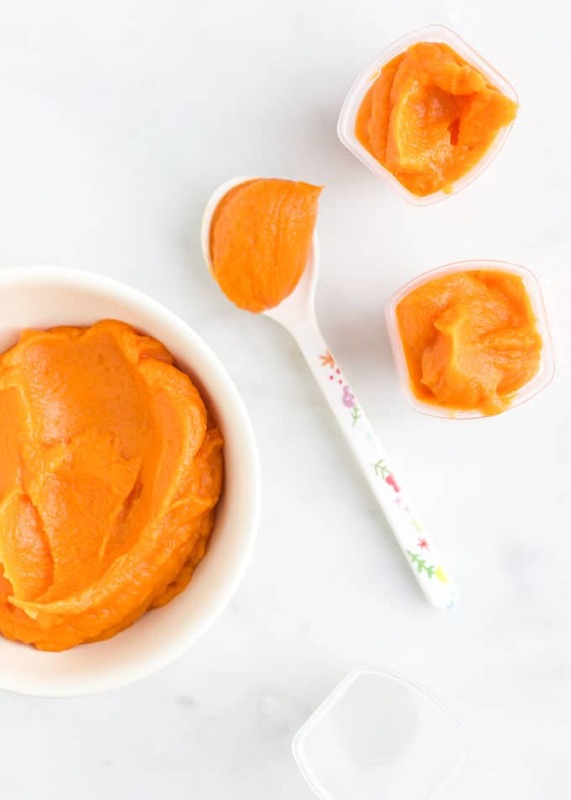 Sweet Potato Puree is a great first food for when you start weaning your baby. However, this delicious puree shouldn't be limited just to babies. Stock some in your freezer to add extra nutrition, flavour and texture to oatmeal, sauces or baked goods. Preheat oven to 200C / 400F and line a baking tray with baking paper/foil. Wash and dry the potatoes. Using a fork, pierce the potatoes several times, on both sides. Place in the oven and roast for around 50 mins (checking after 45 mins), or until the potato is wrinkled and tender. 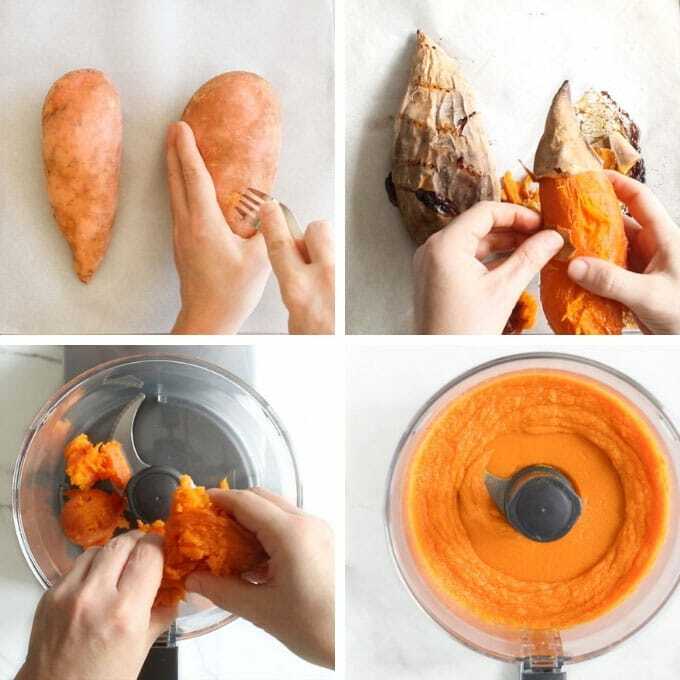 Allow the sweet potatoes to cool for around 10 minutes, peel the potato and place the flesh in a food processor. Blend until smooth. If using large sweet potatoes, cut in half, lengthways, before roasting. The length of time needed will depend on the size and thickness of the potato. SWEET POTATO is my favorite and it looks to delicious, Thanks for sharing..